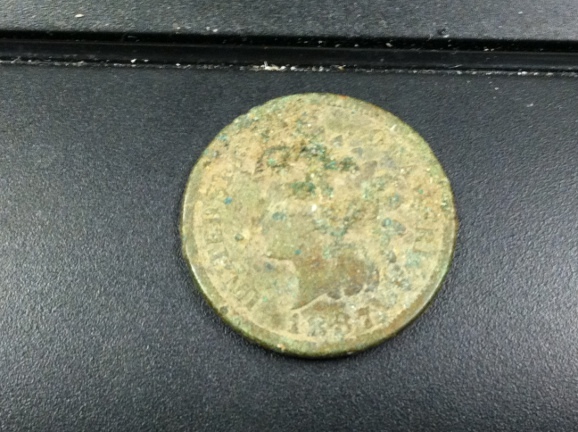 I met up with several members of the Friendly Metal Detecting Forum (FMDF) today in Peabody, Kansas. After the rain we headed to our intended hunting site and we hunted there for several hours. 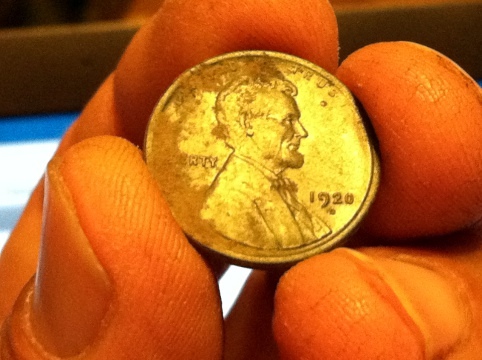 KansasDave found the only silver there, a Roosevelt dime. We had a great time. MrPhoto is a very funny guy and he got me early at the restaurant by telling me he found a silver dollar at a local park that we hunt. The new guy seems like a nice guy. 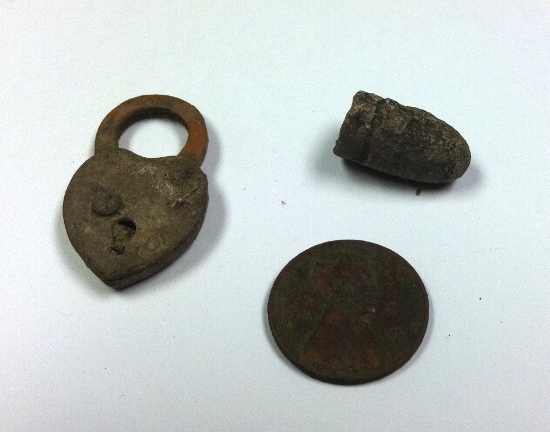 I found some clad coins at site number one. After a while, we moved on to site number two which was an empty lot where old houses once stood and later, mobile homes. We all found clad there and MrPhoto found a really cool token for a laxative from the 30’s. By around noon, we decided to move on to the city’s main park where the county fair was held for a few years. The park dates from the late 1800’s. For the first couple of hours, I found nothing but pull tabs and bottle caps. 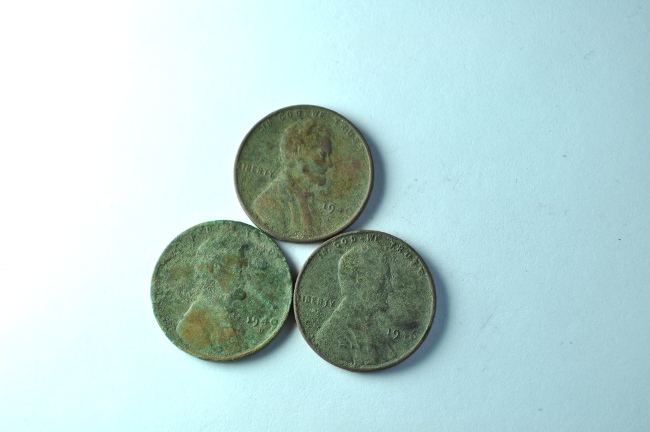 Eventually, I moved toward the entrance of the park and that’s where I found my two wheat cents; a 1919 D, and a 1920 D.
By then, KansasDave had already found his very cool Seated Liberty dime and his very cool Indian Head penny. Redd found a dateless Buffalo nickel. The rest of us made do with clad. I of course, found my two wheat cents. 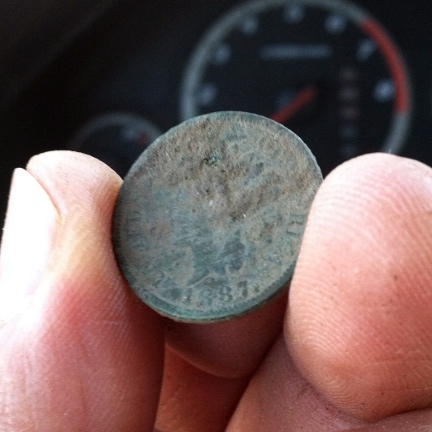 By the time I found the wheat cents and was ready to find me some silver, we decided to call it a day. It was almost 5pm. All in all, I had a very good time. It is good to hunt with others once in a while. We agreed that we would do it again. Meanwhile, Silversmith45 and I are planning a little trip to Winfield, Kansas, where the Bluegrass Festival is now wrapping up. There should be lots of clad and hopefully some jewelry there. 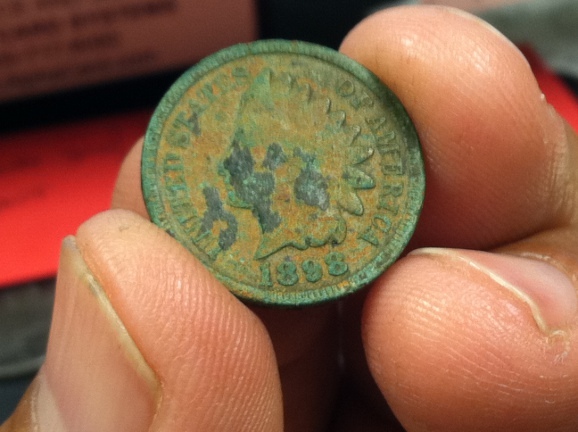 Also, a local hunter there told me that the site of the festival also holds coins from the mid to late 1800’s. It should be fun. I have been hunting a house built in 1917. The house may be older though, as the sidewalk stamp says 1910. 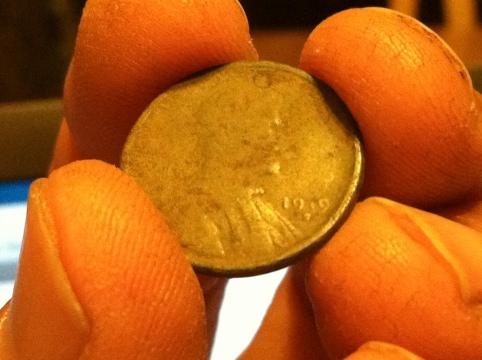 Anyway,in the past I’ve pulled 2 Mercury dimes from the curb strip but no silver coins from the house lawn itself. I carefully hunted the whole property, including the curb in a grid pattern and I thought I was done. The other day however, I did not have a good place to hunt during the 30 minutes that I get to hunt after work, so I went back to this house. 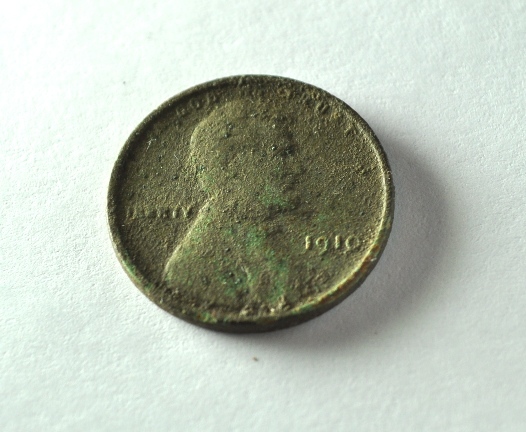 I started re-scanning the curb and I found this little gem. This proves that one should never consider a spot done. Ever. Another metal detectorist told me about finding wheat cents in this small grassy area on a park we often hunt. So after work, having only 30 minutes free to hunt, I went there and within 5 minutes I got a very scratchy signal 6 inches deep. The Target ID on the AT Pro read 92, 94, 95 so I decided to dig it. 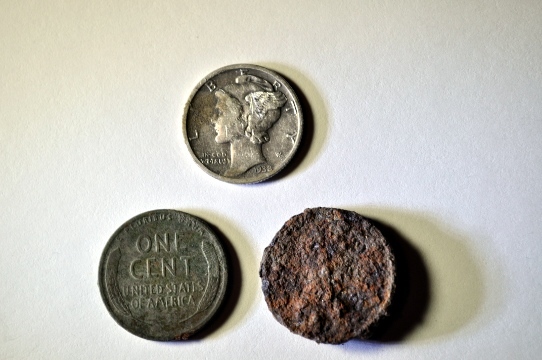 After digging down to 5 inches or so, out came out a 1938 D Mercury dime and a 1926 wheat cent. I checked the hole with the Garrett Propointer and there was still a signal there. 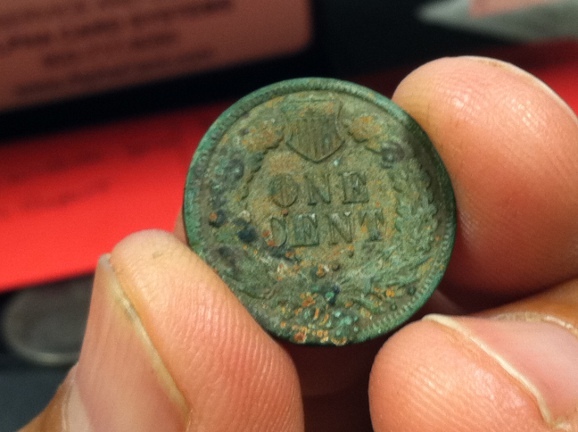 Excitedly, I dug up a very rusted small disk the size of a penny. I knew exactly what it was because the day before, the same guy who told me about the spot, told me that steel pennies get really rusty after being on the ground for a while. Unfortunately, I scratched the merc. I tend to dig very small holes right on top of the target. I am changing that. From now on I will dig 3 inches around the target. Yes, I will make bigger holes but, darn! I can’t afford to scratch any more coins. One of these days I will dig something really valuable and ruin it. By the way, the reason why these coins read in the mid 90’s in the Target ID, is because the AT Pro adds the signals from the individual coins the same way a detector will give a 50 cent signal when two quarters are buried in the ground. I think if the Target ID went higher than 99, I may have gotten an ID closer to 200. 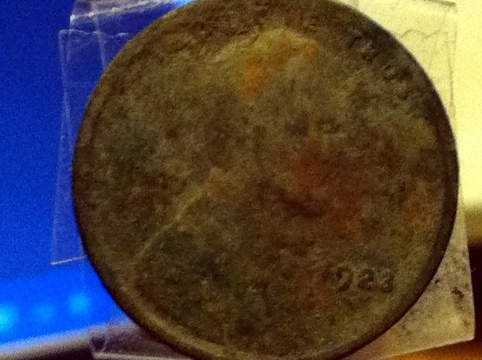 I also believe the signal was scratchy because of the rusted steel penny.